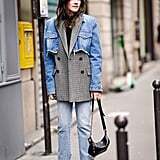 Few layers work as hard in our wardrobes as the trusty denim jacket, especially year round. 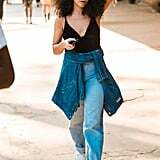 Both nostalgic and modern, the casual-cool staple never fails — in high school, my American Eagle version served as a status symbol, carrying me from classes to mall hangs and school dances. 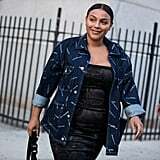 Now, I lean on an assortment of vintage and tailored styles as the perfect midweight layer for work, weekend activities, and, well, basically any time I don't feel like wearing a blazer or trench coat. 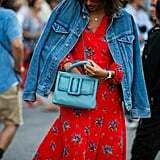 Designers are continuing to reinvent the denim jacket each season, whether it's a reconstructed shape, an updated take on a classic style, or a unique approach to styling the closet staple on the runway. 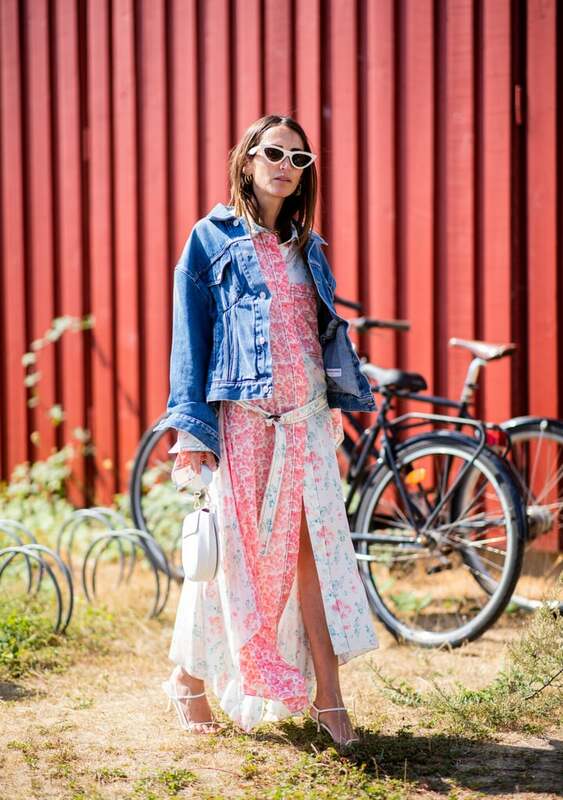 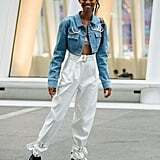 This inevitably translates to the street style scene, where fashion insiders and It girls are championing looks like head-to-toe denim, offsetting feminine staples with the laid-back layer, or mixing it with sporty and tailored pieces for a refreshingly modern look. 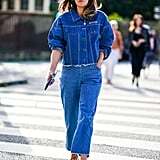 On the funkier end of the spectrum, they're mixing denim jackets with colored denim for a playful take on the Canadian tuxedo and even combining with athleisure pieces for comfy-cute looks you can wear while running errands, on the weekends, or when traveling. 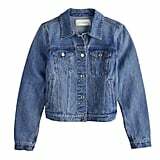 So, in the spirit of rethinking tried-and-true basics we'll never quit, I've pulled 36 of my favorite outfits from the street style scene, all of which offer a fresh perspective on the denim jacket, whether your style is eclectic, feminine, sporty, or polished. 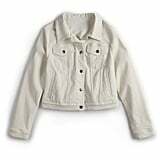 Plus, I've included two affordable denim jackets to shop from the POPSUGAR collection at Kohl's in both classic blue and off-white — my favorite for Summer!